Today's post is all about food, but not just food, it's about the people that create the food. This woman is the matriarch of the family that runs this food stand. Her entire family works, including her 3 year old grandson. While surprising, scary even, this little boy wields a machete like so many Honduran men and whittles away at a stick like he's been doing it for years. And he has -- he started when he was two! Next trip we have to get their names. The stand is called Tortillas.com. I have no idea why. I don't think there is much technology happening up there, but nonetheless, Tortillas.com it is. It didn't take too long to learn something powerful -- the people here subsist on corn. It's corn everything. While I do love corn and corn tortillas make me happy, sustaining life on corn, eating and working with it every day would be tough. It would be difficult to eat the same thing day in and day out no matter what it was, but people like this industrious family do it. The husks of corn are kept steaming so they retain the pliable texture needed to use for wrapping treats like Tamales. 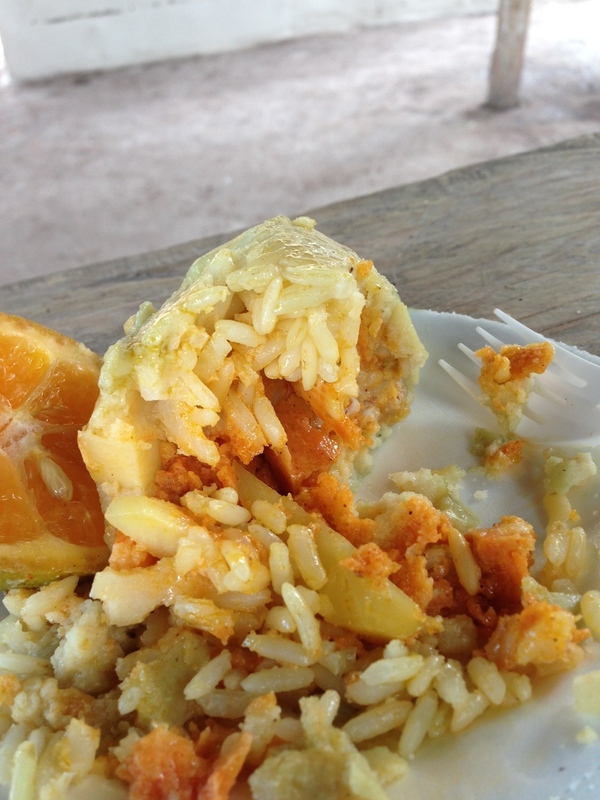 I had my first cup of Atol Elote, a hot, pudding-like drink that is made from corn and milk and fell in love. I had the sweet (dulce) version. Husks are used to help infuse more corn flavor. Put it in the fridge and it becomes the texture of pudding. It is comforting, and while it doesn't have the texture of rice pudding (arroz con leche) it has that same, mom made this to cheer me up feeing going down. The people were so nice to us, offering tortillas and tamales, atol and atol fritas. I insisted on paying and they wanted to put off the discussion and kept plying us with corn-laden treats. It was great to watch them at work, creating delicious food using very basic, primitive materials. The group seemed confused by our excitement about the food and I was feeling a little silly until a customer who had been there for a while approached me to ask where I am from. He told us he is from Chicago and that he misses this food so much. I let him know I didn't blame him one bit and he insisted I try a cup of Atol. He is my new hero. He was very friendly, as were all the people at Tortillas.com that morning. The food was indescribably delicious. The tamales were the best I've had since moving here -- the best I've had, period. They were moist and plump and flavorful with chunks of Chancho for a good bite and a hearty flavor. It could be the fact that we were outside on a damp rainy morning in the mountains eating food cooked over wood-burning clay ovens with the earthy flavor of fire-infused food, but more likely it was the hospitality of the people. The pride they have when sharing the food they work so hard to prepare each weekend morning shows in the smiles and their eyes. We asked for a few of the recipes, but did not want to be too imposing. I'll save my request for the tamale secrets for another time, but as you can see there is rice, celery and potato, among other ingredients like Chancho. I think the orange color is from Achoite, but am not 100% sure. I'll get to the bottom of it in the future. 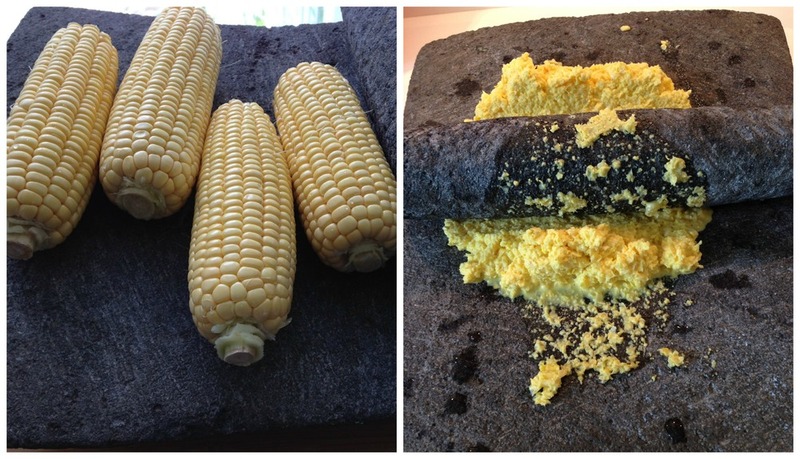 Ah corn, in it's most basic form -- almost. I tried this and didn't fall head over heels, mainly due to the texture and the fact that the sweet corn flavor has been cooked out of it. I'd rather have a barely steamed ear of corn to try with lemon and salt. Maybe next time. And then there were the Pastalitos. Called an Empanada, a Hand Pie, a Pierogi or even a Calzone or a Blintze in other parts of the world. these were the best I've had since landing in Honduras. We liked Tortillas.com so much we made a trip back the following morning for breakfast before heading back to San Pedro. 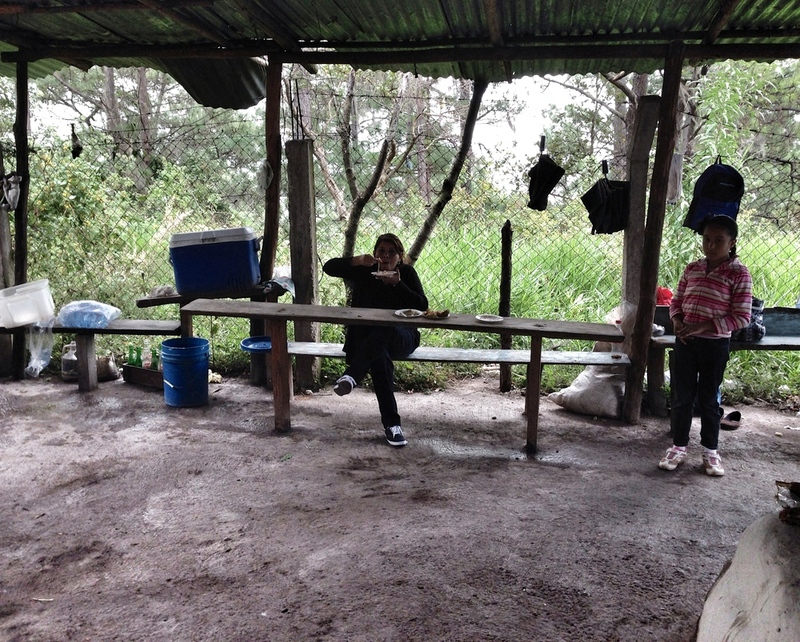 The pastilitos were part of that visit along with the purchase of fresh produce. Once again I think we surprised the group and I am sure it was a good surprise on a Sunday morning. When we got in the car and were talking about how great the two visits to Tortillas.com was and how attentive everyone was we were told a story that made us laugh so hard there were tears running down my face. The night before -- actually, earlier in the morning because we did not get finished with our work until 1:00am -- I took the team to Denny's. We hadn't eaten in 12 hours and were hungry. Our options were Denny's or CircleK. I think the last time I was at a Denny's was when I spent 6 months in Oklahoma City launching a call center and worked crazy hours like this, but I was game. The place was only moderately busy, especially for a Friday night ... errr, Saturday morning. We had great service. The Captain came to our table multiple times and helped our server get the job done. Not something I expected. My Grand Slam with two eggs sunny side up, hash browns, bacon and a biscuit (heart attack on a plate) was done just right. A politician from the Libre party came in and I noticed he looked at me a few times, but thought nothing of it other than we were a big group all of Hondurans with one Gringa in the mix. We ate, had a lot of laughs and went to the hotel. All was right with the world. We accomplished our goals and could go back to San Pedro feeling good about what we had done and I was looking forward to coming back in a few days. With a smile and a chuckle, the story came tumbling out ... the drivers were sitting at a table off to the back where they could see us and the Captain approached them to ask, "Why is the Ambassador traveling without her chase car today? She always has two cars with guards. Where are the others?" And at Tortillas.com they talked about the, "Ambassador taking so many pictures." One told Ana we are the same build and that he is good friends with her and I really look like her! HAHA! I was laughing so hard I could hardly breathe. So, the first thing I did was pull out my phone and Google US Ambassador to Honduras and set my browser to images. All the while Ana, the drivers and I were laughing. I have a doppelgänger, Lisa Kubieske, and she is the Ambassador to Honduras! Or maybe she has a doppelgänger who is an American citizen living in Honduras? Not sure, but being mistaken twice in 24 hours made for a great story. What do you think, would we be mistaken for each other? Coming soon, I'll talk about my attempt at Fritas de Elote.